I’m always fascinated by the Japanese painter, Ikuo Hirayama (1930 – 2009), whose life works were centered on people, culture, and landscapes of the Silk Road. 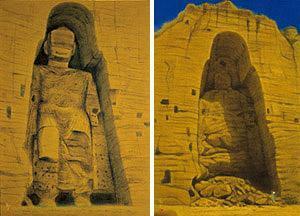 One of his prolific paintings is of a great standing Buddha statue in Bamian, Afghanistan. He produced two paintings: the first in 1968 showing the statue of 55 meters high that had been mutilated (most of the face was chopped up) by some Muslims centuries ago; and the second one some years after 2001, which showed the regrettable utter destruction by the Talibans, depicting ruins on the ground. 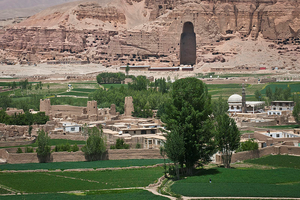 After the fall of the Talibans, UNESCO (United Nations Educational, Scientific and Cultural Organization) took the initiative to maintain and safeguard what was left at the great Buddha sites and the surrounding ruins (a three phased project started in 2003 and completed in 2011). During one of the UNESCO meetings, Hirayama who happened to be a UNESCO goodwill ambassador at that time insisted on NOT reconstructing the Buddha statues. I would like to know what was in his mind and what drove him to such a conclusion. Let’s go back to the early days of Hirayama as a young painter endeavoring to find a meaning to his career. In fact, he was suffering from difficulties: first in making ends meet as a junior faculty staff at Tokyo University of Arts; second as an artist he was seeking his own style; third as a man suffering from the radiation of the atomic bomb that fell on Hiroshima in August 1945. How did he manage to overcome such hardship? One day the idea abruptly came to him of painting a Buddhist monk who, after staggering about in the desert, had made his way to an oasis and was over joyed of his accomplishment which renewed his determination to reach the final destination (perhaps in India). Hirayama mentioned that: “I painted the work so as to seek my own salvation.” In this way, he found Buddhism as his main theme and eventually that evolved into his interest in the Silk Road--the path of spreading Buddhism from India to China. So, Hirayama travelled extensively to places of interest along the Silk Road. It seemed that he had developed his own perception of ancient ruins: Ancient monuments, palaces, cities, temples and whatever that were made and destroyed by people in the course of their history and civilization. Ruins remain without any trace of the people, but the legacy of their history and civilization transcends from generation to generation. Now, I think I can understand his thoughts in opposing the reconstruction of the blasted Buddha statue. Perhaps, Hirayama wanted the blasted statue as it was as evidence of what had happened: somewhat similar in nature to the Atomic Bomb Dome in Hiroshima. I would like to go one step further. Hirayama might have believed that the people of Afghanistan alone had the right to decide what to do with the destroyed statue: rather than UNESCO or any other countries that were interested in lending their support. By this token, I would like to think that Hirayama in heaven would be more than pleased to hear that the people of Afghanistan came to decide on rebuilding the statue. Some facts to follow: UNESCO designated the place as a World Heritage site in danger in 2003. In 2011, UNESCO and the Afghan government decided not to reconstruct the destroyed statue for the time being.